What is calcium scoring and how is a calcium score determined? Calcium scoring is a diagnostic imaging system that uses CT (computed tomography) scans of the coronary arteries to detect the presence of calcified plaque, a substance that builds up inside the artery walls and hardens, making it difficult for oxygen-rich blood to reach the heart. This buildup of calcified plaque in artery walls is called atherosclerosis, or “hardening” of the arteries. When calcified plaques occur in the coronary arteries, the condition is called coronary artery disease, or CAD, which is a leading cause of heart attack and death. 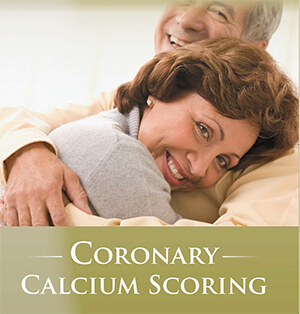 During calcium scoring, the amount of calcium in the coronary arteries is measured and a score is obtained that can help determine an individual's risk for heart attack or heart disease. How is calcium scoring used? The test can be especially important in determining the cause of unexplained chest pain. Before the exam, you'll need to remove any jewelry or metal objects including eyeglasses, and you may be asked to put on a hospital gown. Once the exam begins, you'll lie flat on the CT exam table and sticky electrodes will be adhered to your chest. The electrodes will be attached to an electrocardiograph (ECG) machine which will be used to monitor your heart's electrical signals during the CT scan so images can be made between contractions or “beats.” During the scan, the CT table will move you slowly through the CT scanning machine, often making several passes to obtain an entire clear series of images. You'll be asked to hold your breath at certain points in the scan to move the lungs up and out of the way while images are being made. Most scans take less than 15 minutes. Once the scanning procedure is complete, you can resume your regular activities. The images will be analyzed by the CT scanner software to assess the number of plaques, their density and their distribution so a final calcium score can be determined. The final score will be used by your doctor to assess your heart attack risk and recommend treatment and lifestyle changes when needed. Calcium scoring is a fast and painless method of determining a person's risk for heart attack and heart disease. Most often the answer is no. Some insurance companies may cover the test as long as you have a doctor’s referral and preauthorization. It is best that you check with your individual insurance plan before scheduling the exam. We are proud to offer this exam for the everyday price of $49. No caffeine or smoking 4 hours prior to exam. Payment is due at time of service as this is not service covered by most insurance carriers.